I am so glad someone smocked a Valentine. It sure wasn't I. Angela did though last winter. So cute. I am loving the thought of sleeveless jumpers and sundresses. Perhaps it will drive the cold white landscape away. And I leave you with one of my favorite love songs. I have always loved the Elvis version of this song, but I may be a new convert of this one. Truly beautiful. How can you not love Andrea Bocelli? I love this little dress. SO valentine-y! It was a neat surprise to see Katharine and Andrea on your post. Katharine is my hubby's cousin. I love Andrea's voice and Katharine's too. Martha, I pray you have a beautiful Valentine's day. One of my favorite songs! This is a lovely version. Such a sweet dress, also. Happy Valentine's Day! Love the dress. Makes me cold though! Love anything Elvis sings. Our wedding dance......over 23 years ago.....sigh. 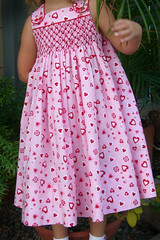 Sweet Valentine dress!Angela does such wonderful work. Thanks for sharing the music video.That song reminds me of my wedding,that was what we had playing for our first dance.